April 29th was a super day at Oakbank, we hosted an all day and night party in honor of Prince William and Kates wedding. Guests arrived at 10am, both here and at Westminster Abbey, and we drank cups of tea from the family china whilst watching the guests arrive in all their posh outfits. This china has been in my family for generations, now it's all mine. Mum bought me these silver sugar tongs from an antique shop, aren't they fabulous! This china madame wears a huge yellow knitted skirt which doubles as a tea cosy. Fun stuff eh! Funnier still is that the man who sold it to me in a charity shop thought it was a hat! We set up a teashop in the kitchen, so we weren't making brews all day. Buffet (L-R) egg and cress, plain crisps and peanuts (in striped paper bags) coronation chicken, banana and poppy seed cake, bread rolls, Tunnocks mountain, traditional lemonade. The Tunnocks mountain. With 'very British' red phone box topper. 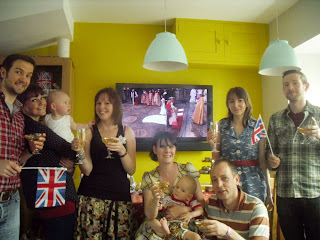 All in all we had a right Royal knees up with laughs, tears, fun and more union jack bunting than you could shake a flag at. Congratulations to Will and Kate, for a day we will all remember.